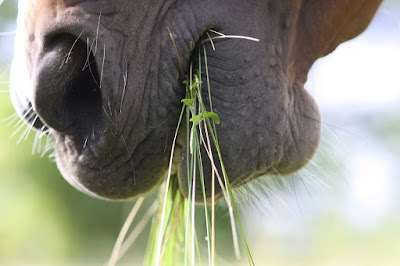 Most cases of laminitis are caused by over-indulgence in sweet, spring pasture. It’s crippling, incurable though manageable, and in many cases the only relief is euthanasia …. Laminitis is a disease that is the dread of the horse world, for both animal and owner. As most equestrians know, laminitis is the painful inflammation of the laminae – the soft tissues that bind the pedal bone of the foot to the hoof wall. 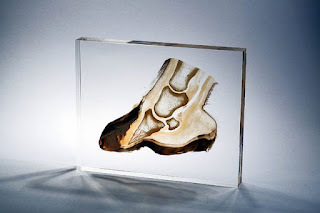 Left untreated the horse or pony will be lame and ultimately there will be complete separation of the pedal bone, which rotates and penetrates the sole of the foot. It is mainly the fore-feet that are affected. With an estimated 7% of horses in the UK suffering from laminitis, it is not surprising that so much research has been dedicated to understanding and preventing this horrible condition over many decades, but the causes remain largely theoretical and a cure elusive. Endocrinopathic Laminits is the type that affects the majority of sufferers –linked to Equine Metabolic Syndrome and generally seen in overweight, underworked horses and ponies who have a high sugar diet, including unrestricted grazing. This accounts for around 90% of cases, which is why springtime, when new sweet grass bursts forth in the pasture, is flagged as laminitis danger season. Sepsis Associated Laminitis can be a by-product of a primary illness or infection in a horse which is already sick. Supporting Limb Laminitis happens very occasionally in lame horses with an injury like a fracture or septic joint . The disease can develop in the supporting limb when the horse spends a period favouring it over the injured leg. What is most frightening for horse owners is that once a horse has been diagnosed and successfully managed through a bout of laminitis, that animal will be susceptible to re-occurrences of the disease. It’s not a condition that can be dealt with and forgotten about. Once your horse is pre-disposed to laminitis, you have to stay permanently alert for signs and symptoms of it coming back. Whether or not your horse has had laminitis previously, you should watch out for the early warning signs and symptoms of laminitis and call in the vet if you have any suspicions that all is not well. Catching it early could spare your horse much suffering, and perhaps even save his life. The damage to the laminae can start microscopically long before the horse shows any signs of lameness. The damage can’t be reversed, but it can be prevented from worsening. 1. Check the pulse in the artery that runs down the back of the fetlock. It should be faint or barely there, but if it is strong (or “bounding”) this is an indicator of laminitis, or other foot problems. 2. It’s normal for horses to have hot hooves occasionally, but if the hoof temperature is high for more than a couple of hours and it’s not a particularly warm day, you should be concerned. 3. Keep a check on hoof growth. Healthy hooves grow faster at the front of the foot; if laminitis is present the hooves grow faster than normal at the heels. 4. If you know your horse’s normal, resting heart rate an notice a sudden rise, this could be a pre-cursor to lameness caused by laminitis. 5. Keep watch on the white line under the foot, where the sole meets the hoof wall. If it is widening or flecked with blood, this could be a sign of laminitis. 6. It’s been noticed that horses with laminitis shorten their stride before showing signs of limping, most obviously on turning at the walk or on hard surfaces. 7. Guard against raised insulin levels by learning how to do insulin checks. An insulin level of over 40 can mean laminitis threatens. 8. A high fever and diarrhoea – an inflammatory response – can also be signs of laminitis. Note, none of these signs are definitively proof of laminitis; merely indicators that should be checked out by a vet, particularly if more than one of these signs are present. Once your horse is diagnosed with laminitis the medical treatment (probably anti-inflammatories and painkillers) will be in the hands of the vet, but there is a great deal you can do to help him overcome this debilitating condition – not least of which is to follow the vet’s instructions to the letter! If he’s put on box rest, which is likely, you’ll need to ensure he has deep, soft bedding (a thick layer of shavings is comfortable and supportive), a prescribed diet, and plenty of fresh, clean water available. Boredom busters in the form of stable toys are a good idea, but guard against sweet treats, particularly if he’s already overweight. Avoid stress – having contact with companion horses can help in this respect. When he’s well enough to be turned out to pasture, consider using a grazing muzzle and turn out during the night when grazing fructan levels are lowest, or, better still, turn out in a zero-grazing environment. There’s no need to starve your horse, but it is important to monitor his diet and weight carefully. The idea is to keep his digestive system on top form and maintain a healthy hind gut, which is where the toxins that cause laminitis can build up. The nutritional needs of a horse depend on his breed and workload. If in doubt consult an equine nutritionist. In general, high fibre, low sugar and “little and often” are the rule of thumb for a healthy horse. Make sure your horse has plenty of exercise, is allowed to carry out normal behaviours and has companions to minimise stress and prevent depression. Have a reputable farrier attends to the horse’s feet every five or six weeks, and feed supplements to promote healthy hoofgrowth. While laminitis is painful and debilitating, when properly managed – and preferably prevented in the first place – it need not impede your horse from living a happy healthy life.